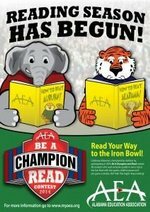 The Alabama Education Association is sponsoring a contest to promote reading. The "Be a Champion and Read" contest will begin next week. HMS students in 6th-8th grade will receive a reading log form during library class. 9th grade students may stop by the library and pick up a form. If the student reads 6 books and has a parent sign the form and returns the form to Mrs. Tew in the HMS library, that student will be entered into a state-wide drawing to win Iron Bowl tickets! 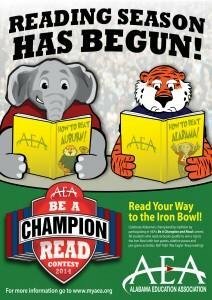 Students that turn in forms will also receive an Alabama or Auburn bookmark and a certificate for participating in the contest. All forms will be due back to Mrs. Tew on or before October 30th! Please contact Mrs. Tew if you have any questions about this reading promotion contest or visit the website listed below! Happy Reading and Roll Tide or War Eagle!